We received an invitation from the energy company Segen to visit a wind turbine that has been installed near us. I was particularly interested to see it and get some practical information, with the idea that perhaps we could have a turbine in the clearing at the top of our wood, if it were on a high enough tower. 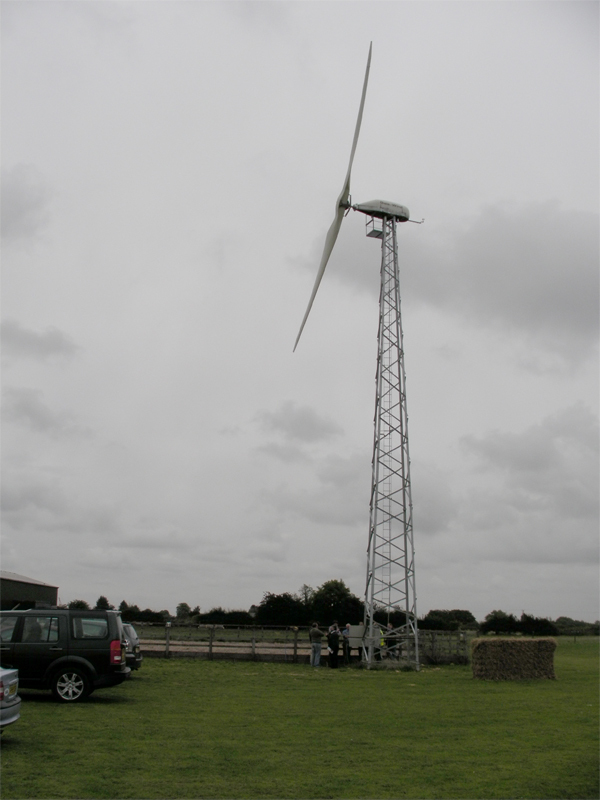 This is a Gaia 133 11kW Small Wind Turbine of which has generated 23,600kWh within its first year with the NOABL windspeed of 5.1ms measured at 10m. However, after just a few questions it became obvious that it was a non-starter for us. The engineer reckoned that to avoid turbulence (which would reduce the performance and the life of the turbine) it would have to be at least 200 meters away from any trees. Impossible for us. It was, though, a chance to learn things I didn’t know. Like the fact that the turbine always rotates at the same speed, with stronger winds generating more power through increased torque. And that it includes an electric motor to kick it into this speed at lower wind speeds. I was also amazed at the complexity of the electronics needed in the control box at the base of the 18 meter tower.